SAN LUIS OBISPO — Nearly 1,000 students are eligible to graduate in three ceremonies at Cal Poly’s 34th annual fall commencement Saturday, Dec. 9. Ceremonies are set for 9 a.m., 1 p.m. and 4 p.m. in the Cal Poly Recreation Center. The theme for this year’s commencement is “Mustangs Forever.” The ceremonies will include a retrospective slideshow of the graduating students during the processional, the “proud pinning” ceremony and a celebratory surprise. 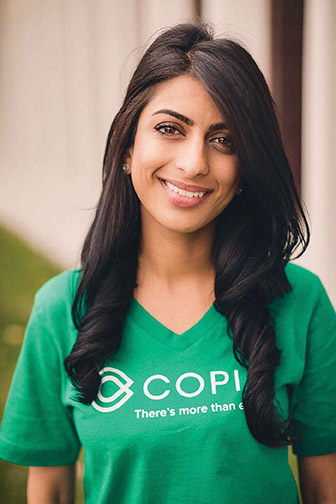 The keynote speaker is Komal Ahmad, founder and CEO of Copia, a Bay Area nonprofit-turned-public benefit corporation that tackles poverty by redistributing surplus food to feed people in need. Ahmad (pictured below) launched the startup as a UC Berkeley integrative biology senior after meeting a homeless veteran. She learned he hadn’t eaten in days yet was within walking distance of a dining hall were excess food was being thrown away. The encounter sent her on a quest to help eradicate hunger while reducing food waste at scale. Ahmad has led Copia in recovering more than 830,000 pounds of food and is on track to feed a million people with high-quality food that would have otherwise been wasted. Along the way, she has received several awards for those efforts: University of California’s “30 Under 30” Global Food Changemaker; Fast Company’s Most Creative People in Business; Toyota’s Mother of Invention; and the Nelson Mandela Humanitarian Award. About 10,000 visitors are expected to attend fall commencement’s three ceremonies. Each 90-minute ceremony will be live-streamed online with closed captioning for those unable to attend. The 9 a.m. ceremony will recognize graduate candidates from the College of Agriculture, Food and Environmental Sciences and the College of Science and Mathematics. Candidates from the College of Liberal Arts and the Orfalea College of Business will be honored at the 1 p.m. ceremony. Candidates from the College of Architecture and Environmental Design and the College of Engineering will be recognized at 4 p.m. Permits are not required to park on campus during commencement. For more information on ceremonies, parking, and shuttles, please visit: http://www.commencement.calpoly.edu/.